Born in 1983, in Chiba, Japan. 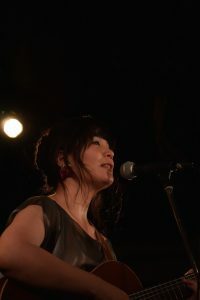 Hana Kogure started to produce her original songs when she was 15 years old. She has been introduced throughout Japan since 1999, and Portugal since 2008. Her outstanding voice and tender tone are bringing fresh surprise to the audience everywhere. Teatro Municipal da Guarda(Guarda, 2011), Salão Nobre-Câmara Municipal de Barcelos(Barcelos, 2011), Maus Hábitos(Porto, 2008/2009/2010/2011), Cabaret Maxime(Lisbon, 2009), Bixo Mau(Caldas da Rainha, 2011), Sala Arte á Parte(Coimbra, 2010/2011), Teatro Turim(Lisbon, 2011), Cinema Nimas-Japan in Lisbon(Lisbon, 2009), Festival Adição+(Caldas da Rainha, 2009) etc. Minami-Aoyama Mandala(Tokyo, 2012), Egg-man East Tokyo(Tokyo, 2012), Osaka Ruido(Osaka, 2007-2011), Shinjuku Ruido(Tokyo, 2009-2012), Dress Akiba Hall(Tokyo, 2009), Theater Kamiya(Kobe, 2007), Sakira Performaning Arts Center(Shiga, 2007), TakuTaku(Kyoto, 2005) and others. Goro Nakagawa, Tetsuro Kashibushi, Hitoshi Higashino,Masaru Watanabe Takerou Sekijima, Hiroshi Funato among others. Copyright © 2019 【公式】 小暮はな オフィシャルサイト All rights Reserved.